WELCOME HOME! 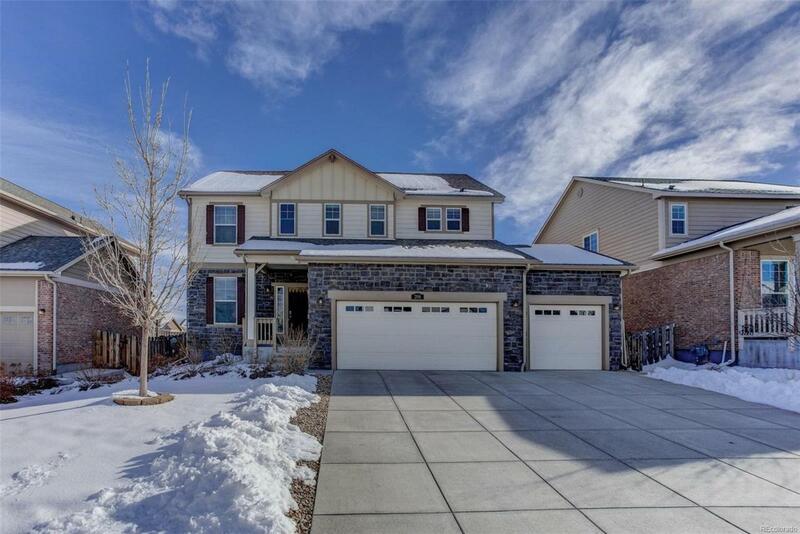 This home has great curb appeal with stone accents, oversized three car garage and quaint front porch. The main floor features an office with French Doors, welcoming kitchen with quartz countertops, stainless steel appliances and center island, family room with cozy gas fireplace and eat-in-dining room. This open floorplan leads to a large patio and yard with gardening beds, sprinkler system and rainwater catcher. The indoor/outdoor layout is perfect for entertaining friends and family. There are four bedrooms upstairs with three bathrooms, including a jack-and-jill bath and master suite with double vanity with quartz countertops, walk-in shower and generous walk-in closet. Adonea is a lovely walkable neighborhood with a community pool, parks and wide-lit streets all close to Vista Peak Schools. It's in a convenient location near Denver International Airport and E470.